Up until recently, it was almost impossible to get a road-ready gaming laptop which could tackle most, if not all the latest AAA titles with ease. That is, until ASUS unveiled its Zephyrus line of gaming laptops last year at the Consumer Electronics Show. 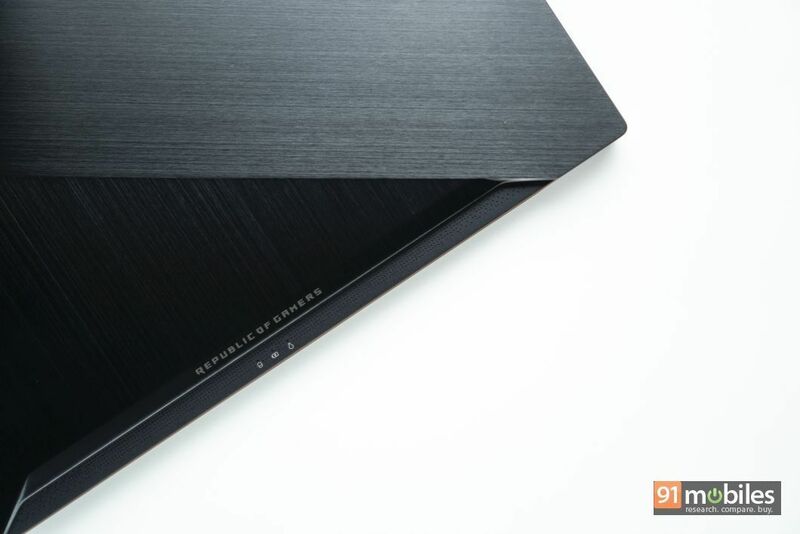 Back then, the Zephyrus was a unique, one-of-a-kind gaming laptop which employed Nvidia’s Max-Q technology to offer a relatively sleek chassis without compromising on the performance. Now, ASUS has announced the successor to the laptop in the form of the ROG Zephyrus M GM501, which builds upon the same design, albeit offers slightly different specs and retails for significantly less. I managed to get my hands on a unit and after using it as my daily driver for two weeks, here’s what I make of it. 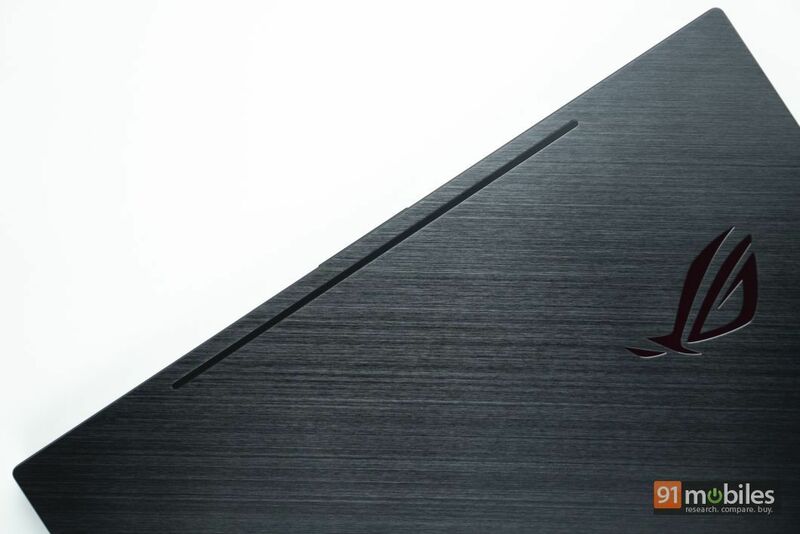 ASUS has pulled all stops in designing its latest Zephyrus laptop. From using premium materials like metal in its construction, to etching a double hairline finish on the lid and topping it off with a glowing RGB logo, the company has dressed its flagship gaming laptop up to the nines. 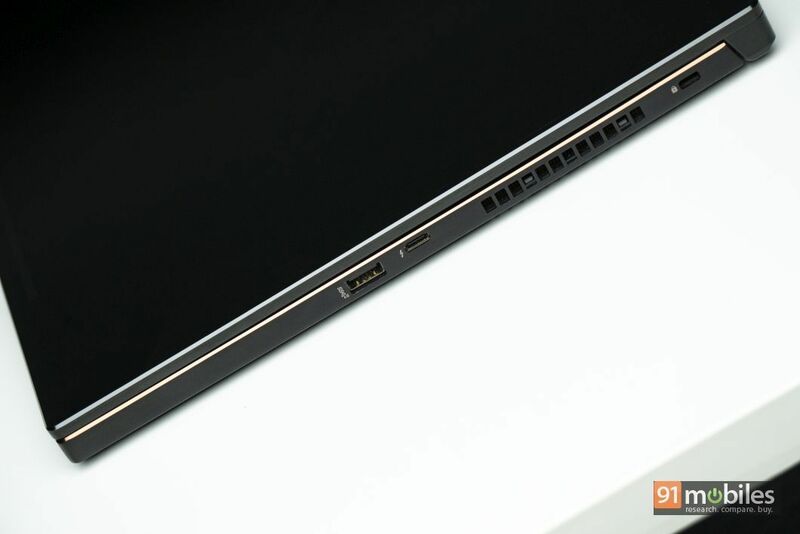 And the best part about the design of the laptop is that it doesn’t come across as garish or loud. On the contrary, I would say that the machine boasts an extremely minimalistic look, with a few gamer-y touches added here and there. Now, I don’t know about you but I’m all for understated and subtle designs and to that extent, the ROG Zephyrus M GM501’s design is bang on. That said, I don’t want to take the spotlight away from the laptop’s remarkably thin chassis, which simply put, is an engineering marvel. 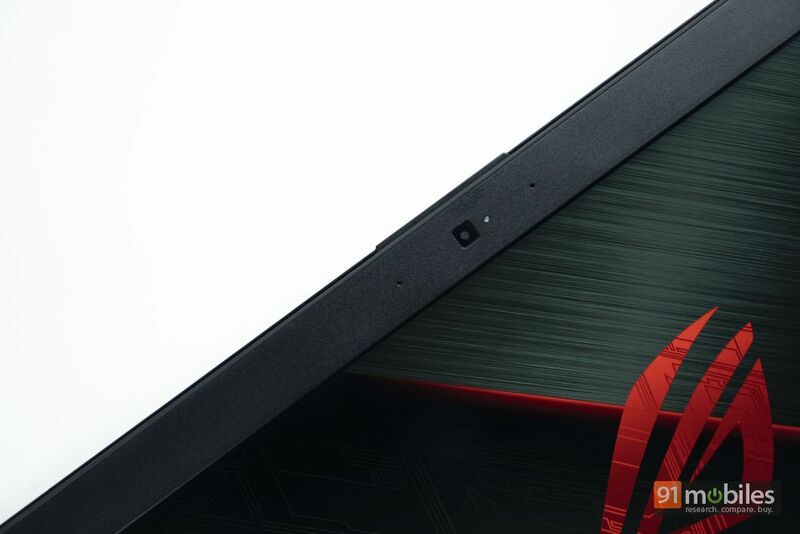 The laptop measures just 17.5mm, making it quite possibly the slimmest gaming laptop in the market. By now, you must be wondering how a machine of the Zephyrus’s calibre stays cool. 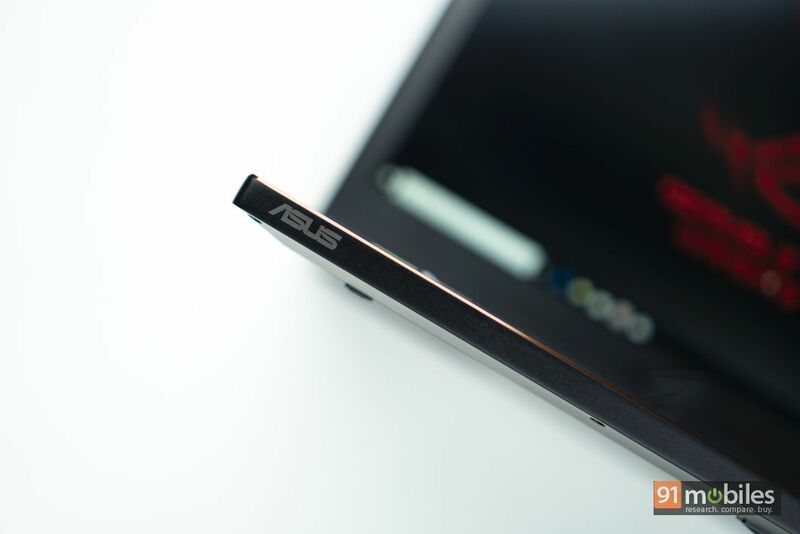 Well, folks at ASUS have come up with a clever solution to keep the laptop’s internals from throttling and have added a dual-hinge mechanism at the bottom. Therefore, every time you pop open the laptop’s lid, the machine automatically lifts 9mm above the base, giving room for ample air circulation. But can the hinge break if one applies too much pressure on the keyboard? Probably, if you squat on the laptop’s keyboard. However, the mechanism will hold just fine if you’re using the laptop as it is intended to. 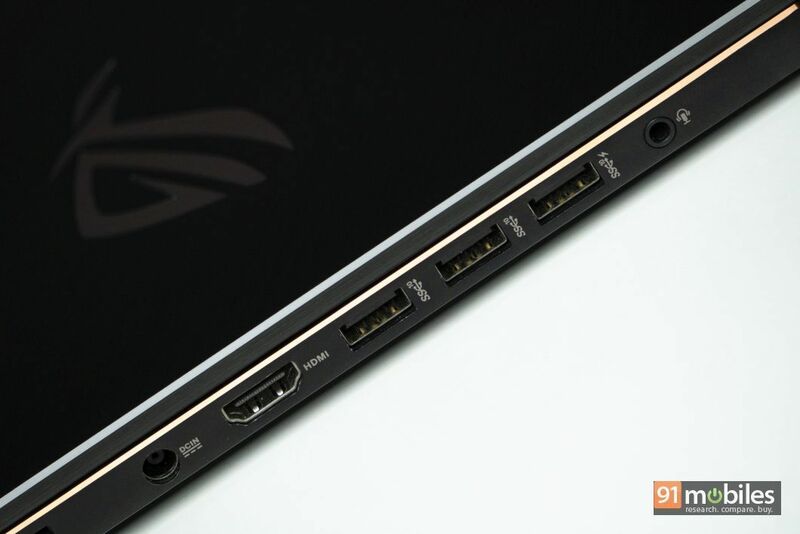 Thankfully, ASUS hasn’t used the laptop’s thin profile as an excuse to omit ports and with the Zephyrus M GM501, you will get four USB 3.1 Type-A ports, one USB 3.1 Type-C Thunderbolt port, one HDMI 2.0 socket as well as a 3.5mm headphone jack. Perhaps the only downside is the lack of an RJ-45 Ethernet port. Also, it would’ve been nice if the laptop shipped with a fingerprint sensor for seamless authentication too. Now, while the laptop is quite sleek, it is by no means lightweight and the machine tips the scales at a whopping 2.5 kilos. Coupled with its chunky power brick (which you’ll have to carry everywhere to get the best possible performance out of the device), you’d better start working on your shoulder strength before you pull the trigger on the ROG Zephyrus M GM501. When you’re shelling out upwards of 1.5 lakh rupees on a gaming laptop, you expect it to ship with an impressive display and the ROG Zephyrus M GM501 doesn’t disappoint in this department either. The laptop I was sent for review features a 15.6-inch IPS panel with full HD resolution. More interestingly, the display comes with a refresh rate of 144Hz and let me tell you – once you get 144 hertz, anything less will make your eyes hurt. Sad excuse for poetry aside, the display on the Zephyrus M GM501 is outstanding. The matte-coated panel keeps reflections and glares to the minimum, the viewing angles are satisfactory, and the high refresh rate makes everything seem buttery smooth. My only critique with the panel is that I wish it wasn’t bordered with thick bezels, which not only take away from the laptop’s otherwise gorgeous aesthetics, but also make the footprint of the machine larger. A gaming laptop is only as good as the sum of its parts. Consequently, while you’ll need a powerful processor and a superb GPU to run games, you’ll also need an excellent keyboard to enjoy said titles to the fullest. Having said that, the Zephyrus M GM501 once again met my expectations as the device offers a fantastic keyboard with well-spaced out keys, four-zone AURA RGB lighting, adequate key travel and a comfortable palm rest. What’s more, there’s almost zero flex at the centre or around the edges of the keyboard. My only complaint with the laptop’s keyboard is that the backlit LED is a bit finicky and it wouldn’t load up my custom preset whenever I turned on the device. Therefore, in order to get the LED light to work, I had to open the companion Aura Core software and toggle the ‘boot up’ setting on again. As for the trackpad, well, I didn’t find much use for it as I’d paired the laptop with Logitech’s G502 Hero gaming mouse. However, during my brief stint with the unit, I noticed that the trackpad offered precise inputs and since it comes with support for Windows precision drivers, you’ll be able to use multi-touch gestures with it too. On paper, the ASUS Zephyrus M GM501 is a powerhouse of a laptop and the unit is backed by Intel’s 8th gen Core i7-8750H hexa-core processor which works alongside 16GB of DDR4 memory clocked at 2,666MHz. For graphics, the laptop ditches Nvidia’s Max-Q technology which was championed by last year’s model and instead, ships with a desktop-class GTX 1070 with 8GB of GDDR5 VRAM. In terms of storage, ASUS has employed a hybrid storage solution comprising a 1TB Firecuda SHDD and a 512 gig M.2 PCIe SSD. Going by the specs, you’d assume that the Zephyrus M GM501 can crunch through tasks like it’s nobody’s business. While that’s true, the caveat is that the laptop suffers from – for the want of a better term – poor thermal management. You see, much like Brian O’Conner’s 1995 Mitsubishi Eclipse, the laptop’s chassis is just not cut out to handle the raw horsepower pumping through its innards. 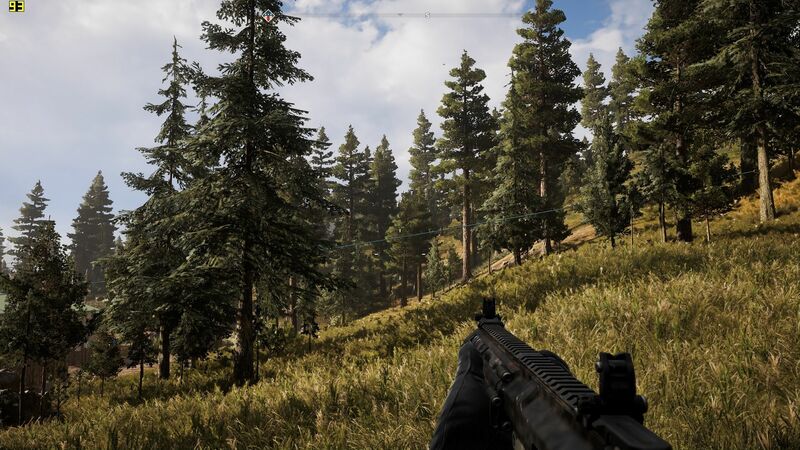 On one occasion, the CPU and GPU temps spiked over 90-degrees when I was playing Far Cry 5, resulting in the unit shutting down automatically. Now, to its credit, this was a one-off thing. However, even in my subsequent gaming sessions, the core temps never dipped below 88 degrees when I was playing intensive titles on the laptop, which isn’t very reassuring. Quite honestly, ASUS should’ve opted for the Max-Q variant of the GTX 1070, which has a lower TDP and is much easier to cool too. But, as things stand, I’ll recommend buyers not to play graphically-intensive games on the laptop for over an hour at one stretch. Thermal management issues aside, the laptop is quite the performer. I was able to run games like Far Cry 5 and Monster Hunter World: Deluxe edition on Ultra graphics preset comfortably. 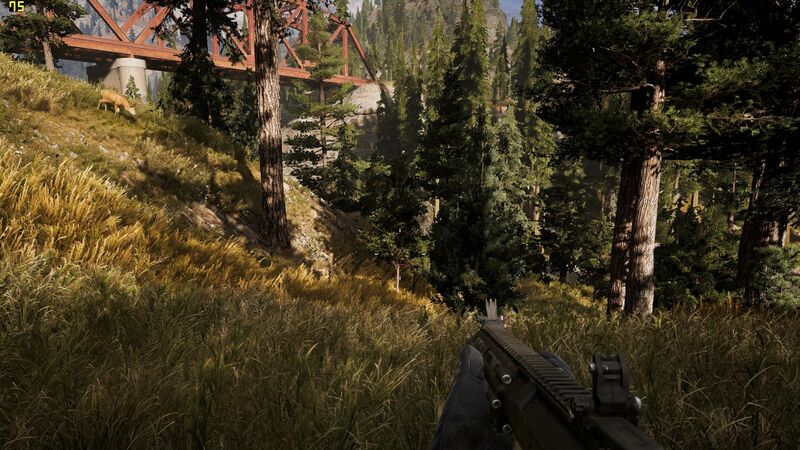 What’s more, since the laptop’s high-refresh display works in synergy with Nvidia’s G-sync technology, I didn’t notice any screen-tearing issues whilst gaming either and all in all, the system’s responsiveness was outstanding. Bear in mind that the fan noise gets quite loud and even though the unit ships with good-sounding speakers, you’ll have to use headphones to drown out the noise. 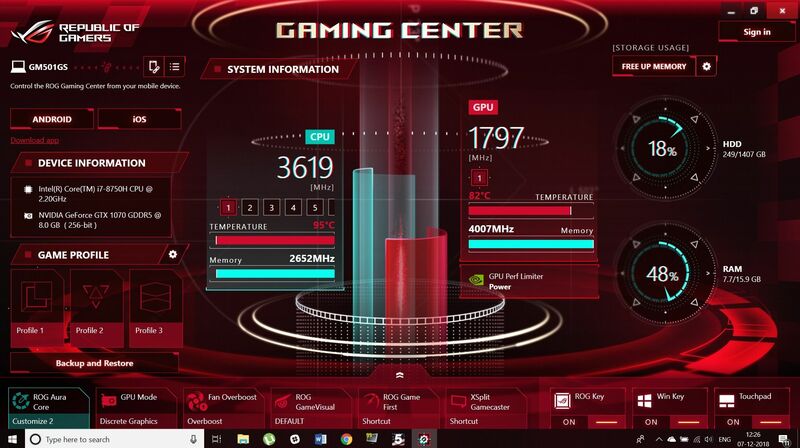 I did run some benchmarks on the Zephyrus M GM501 to give you a better idea of the laptop’s performance. In Cinebench R15, the machine manages to score 107.15fps in the OpenGL test and 1025 cb in the CPU test. 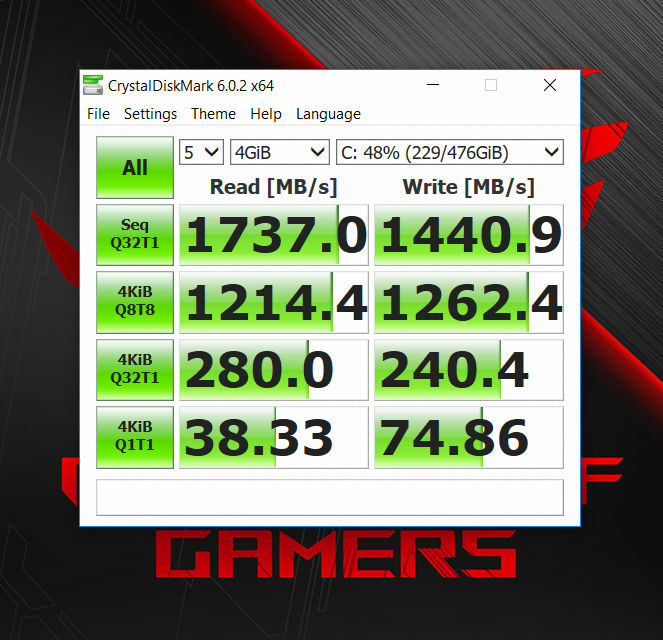 Results from CrystalDiskMark were just as good, with the laptop’s SSD achieving 1,737MB/s and 1,440.9MB/s in sequential read and write tests respectively. Unfortunately, try as I might, I couldn’t get PCMark 10 to run on the laptop as the app kept crashing. As is the case with most gaming laptops, the ASUS Zephyrus M GM501 fails to impress in the battery department. Under normal usage, I managed to drain the unit completely in less than three hours. Consequently, I didn’t leave my house without the laptop’s chunky charger in my bag. The ASUS ROG Zephyrus M GM501 starts at Rs 1,65,900 and for the price, offers an elegant design, stunning display and industry-leading performance in a relatively compact form factor. Unfortunately, the laptop’s USP – which is its sleek chassis – is also its biggest drawback as the unit doesn’t handle thermals very well. Now, provided you don’t mind trading a bit of performance at the expense of portability, the Zephyrus M GM501 will not disappoint you. However, if you’re looking for a laptop which will stay cool during night-long gaming sessions, then you should probably look elsewhere.